One of the things I noted about Badger back when I did a review of their range was that they’d always managed to resist the lure of the “craft dollar”, sticking to solid, traditional beers (albeit with a range twice the size it should be). Obviously they took my comments to heart, because they’re definitely glancing toward the craft market with their latest beer. The name – An American Venture – tells you to expect buckets of classical US hops, although how far they’ve dared to push it remains to be seen. The branding is a subtle diversion from their usual fare too, with a plainish brown label (on a brown bottle!) and just a faded echo of the main Badger branding. So far, so good. The big number 1 on the bottle is because it’s the first of four limited editions appearing over the next couple of years exploring different international beer styles, but all resting on the same base malt recipe. While they’re certainly not the first brewery to experiment like this, it does at least suggest there’s some interest in Badger HQ for something new. And yet, I can only assume that this is a brewer’s pet side-project that he’s snuck out of the door without bothering to tell anyone in the marketing department. There’s no mention of it on their own website; there’s a couple of vague mentions on their social media but that’s about it. There’s no sign of it in our local Waitrose, and I can’t see it listed on Ocado either – the two outlets their scant publicity explicitly mention as suppliers. So, if you do want to try one for yourself it might be a challenge to even find it. But, should you even try? Well, it’s a good looking beer; a crystal-clear, rich golden pint with a fairly big but open and rapidly fading white head on it. The nose is not exactly what you might expect from a “West Coast Style Beer”; a sugary sweetness, light honey and just a hint of the 6% ABV. There’s a slight leafy green note, and while gentle pale fruits do slowly appear the longer it sits in the glass, it’s not exactly a hop bomb. It’s a little more satisfying in the mouth; honey and tart grapefruit fading to more peachy tones and a nice sharp finish that lingers nicely, drying as it does so and ending with quite a deep hoppy bitter aftertaste. The alcohol is definitely present in the taste too; if anything appearing more strongly than that ABV would suggest – if you told me this was a 7%+ beer, I’d believe you. This is a curious beer; on one hand it’s a rather restrained take on the style, but on the other it’s a significant departure from what Badger usually produces – I’m guessing they’re trying to hit a sweet spot of doing something new without scaring off their usual drinkers, and perhaps they risk falling between the two stools in the process. Coupled with the total radio silence and almost complete unavailability of the beer, it does make me wonder if we will ever see the other beers in this series. I rather hope so, if only because I’d like to see just how bold they can go with it. 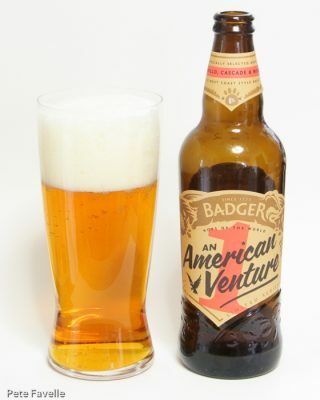 I’m struggling to rate this beer; there isn’t anything particularly wrong with it, and it feels like Badger deserve points for tiptoeing out of their comfort zone, but at the same time it doesn’t really excite me and it certainly doesn’t send me hunting on the Web for suppliers. 2 stars, but take that as a challenge to do something more special with number 2, Badger! Many thanks to Badger for providing this sample to taste.